For students from NMIT (Nelson Marlborough Institute of Technology), please view the videos below, then visit the NMIT Case Study page for further case study information. You will need the password supplied to you in your course to access the case study page. The AU$1.4M Dive Supervisor Simulator Project created a world first for the commercial diving industry by adapting existing airline, and maritime simulator concepts specifically for the diving environment. Video prepared by MomentumCo. Explanation by the late Paul Butler, Former Executive Director of the Australian Diver Accreditation Scheme. 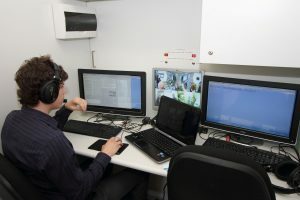 The Simulator was launched at The Underwater Centre Fremantle on November 20th, 2010. Here are some of the highlights from the launch. Play the video to see and hear some of the technical details of running training in the saturation diving simulator from the Simulator Engineer, Bronwen Campbell of Active Learning Partners. This video was created by IMCA (International Marine Contractors Association)during the demonstration visit to Aberdeen in Scotland, 2012. ADAS (Australian Diver Accreditation Scheme) air diving control panel simulator.